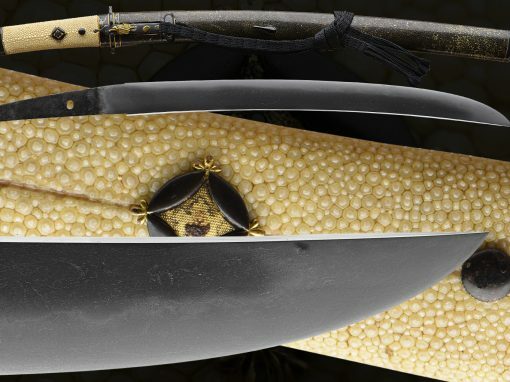 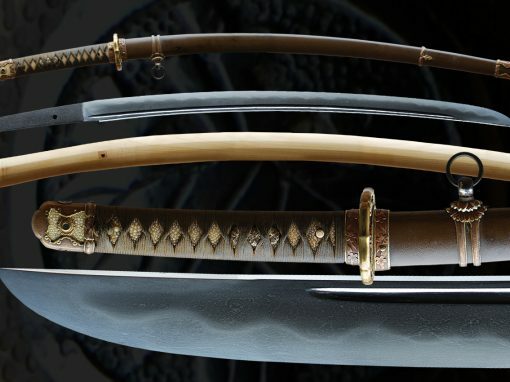 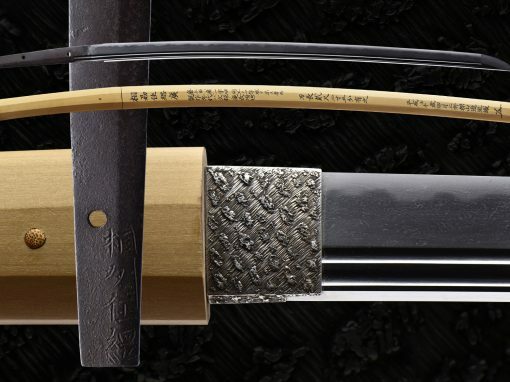 This wonderful katana has great workmanship and a beautiful Hoso-suguha hamon. 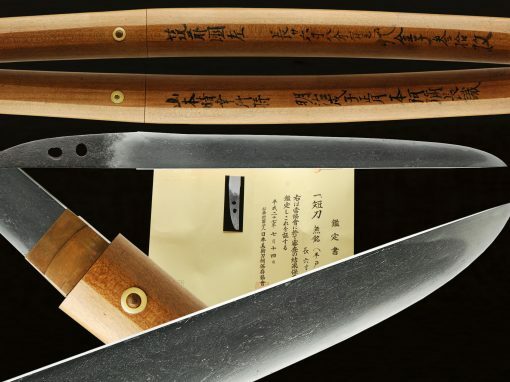 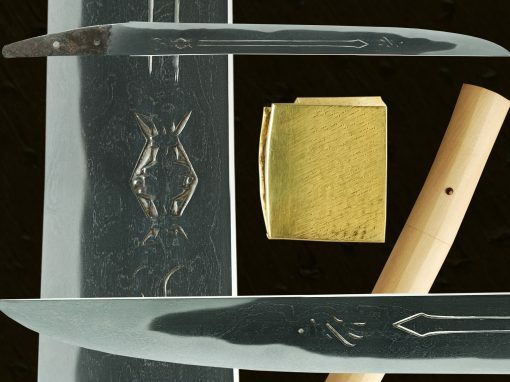 The blade is suriage with the remnants of an old two character signature of Mori Shige. 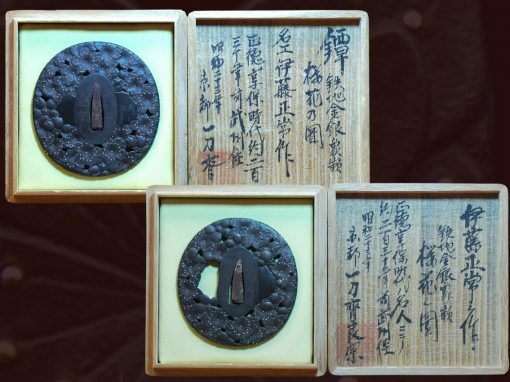 A spectacular collection of activity with , Sunagashi, Kinsuji, and more. 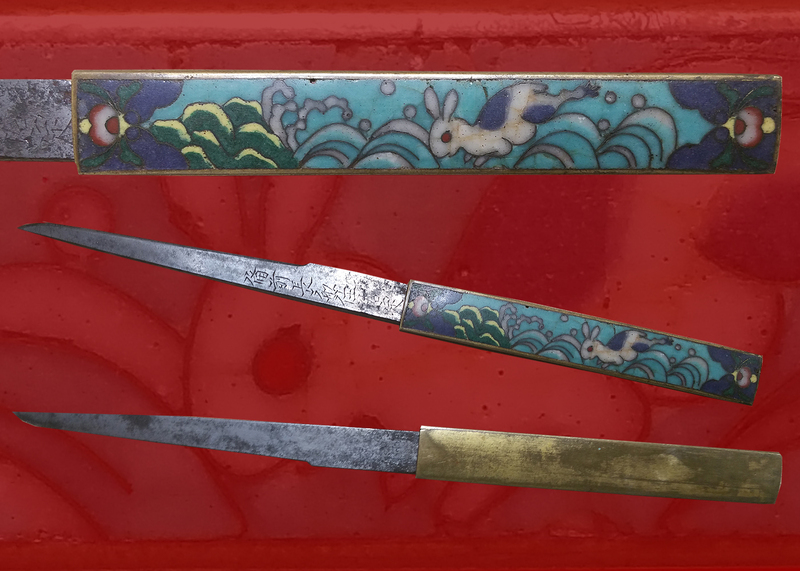 Ji-nie and utsuri can be seen. 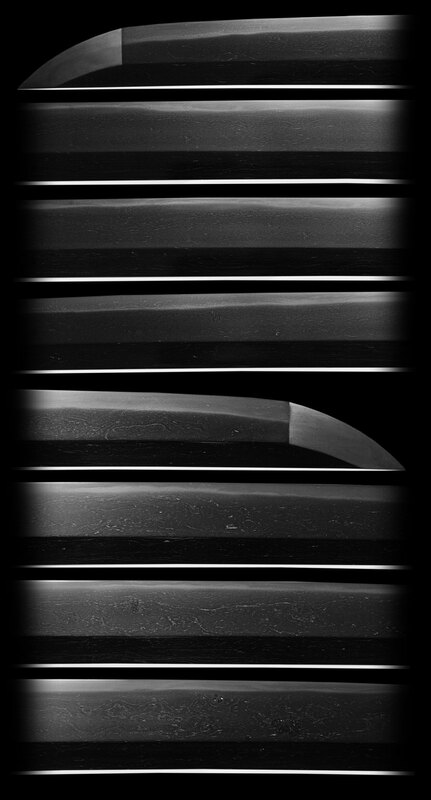 There are several areas of small hardening patches on the Ji. 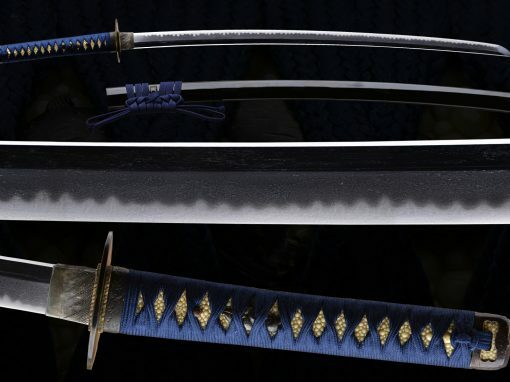 It is in a very nice polish with a very nice set of koshirae. 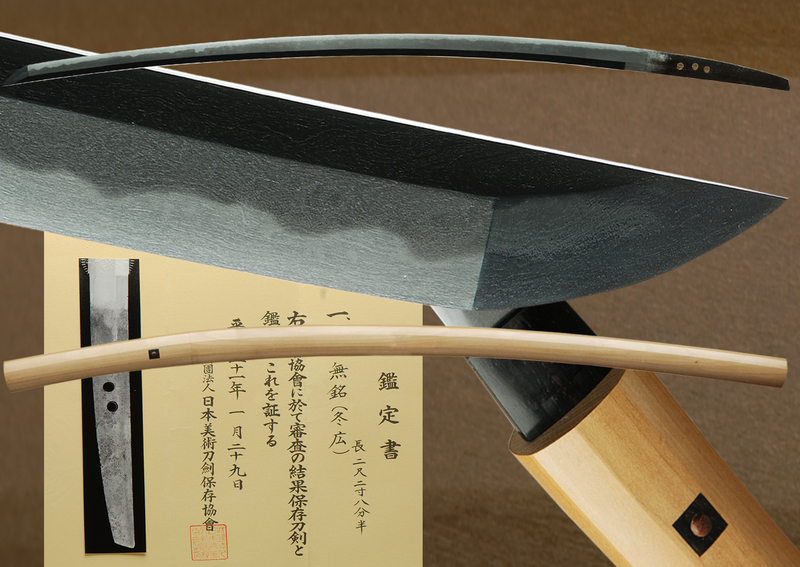 The hamon is very nicely done with a modest nioi-guchi. 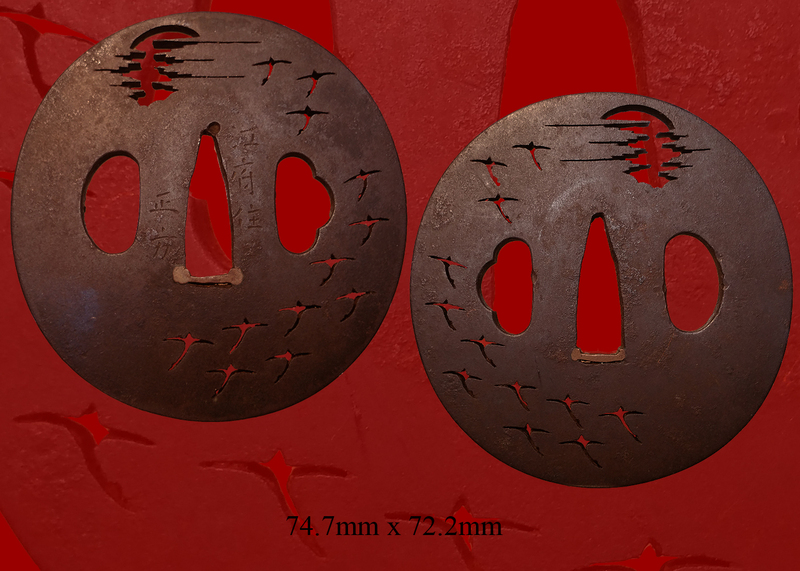 It has some hataraki and ji-nie throughout. 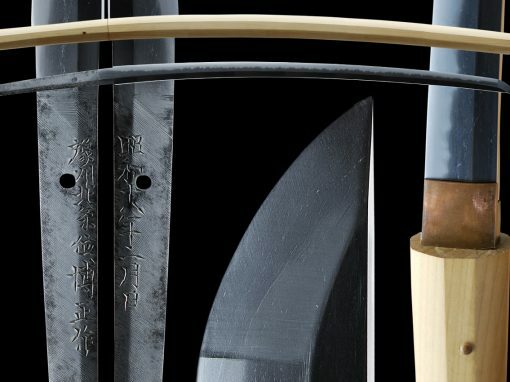 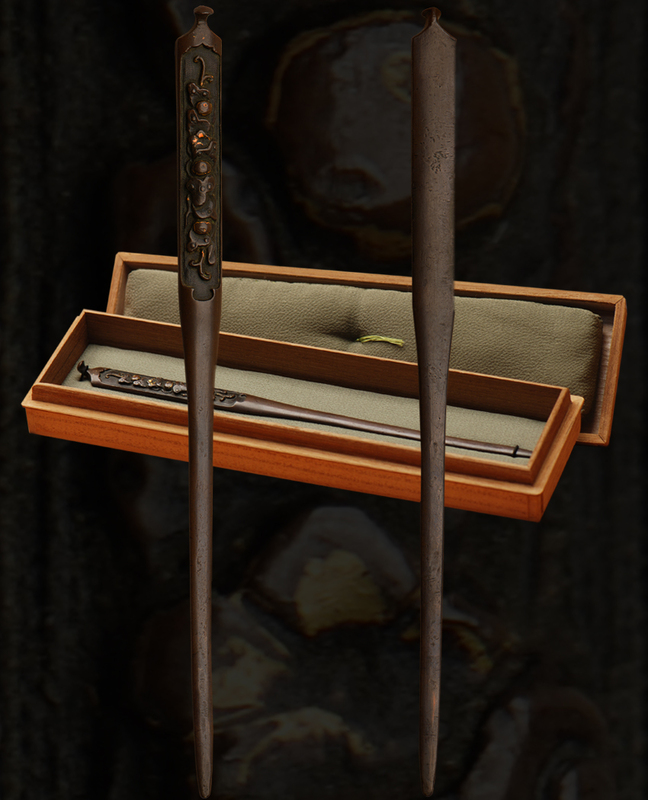 The hada is nicely forged with a slick looking itame nagare with masame. 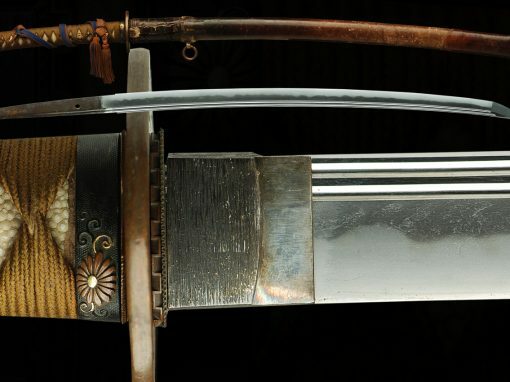 There is some minor coarseness visible in the Jihada. 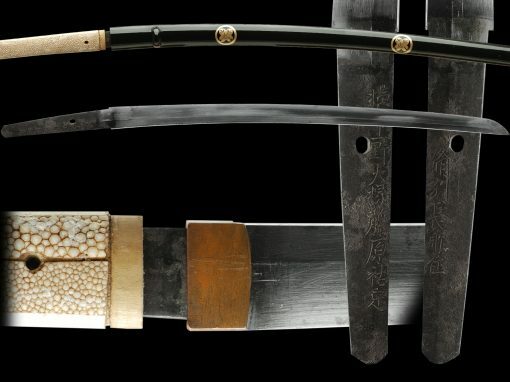 The boshi is ko-maru with hakekake like finish. 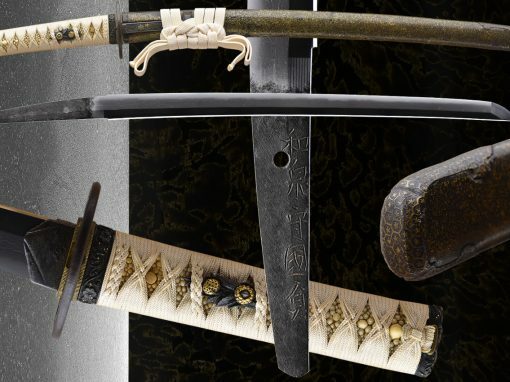 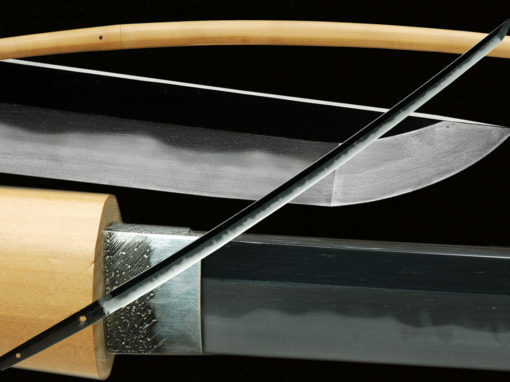 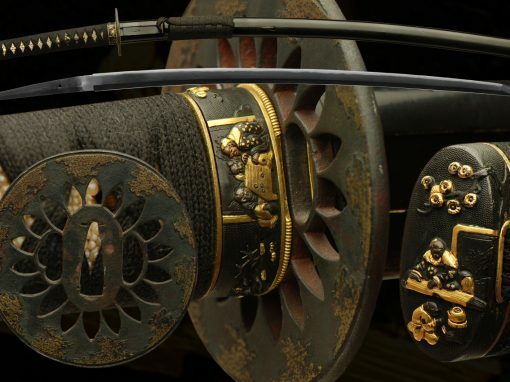 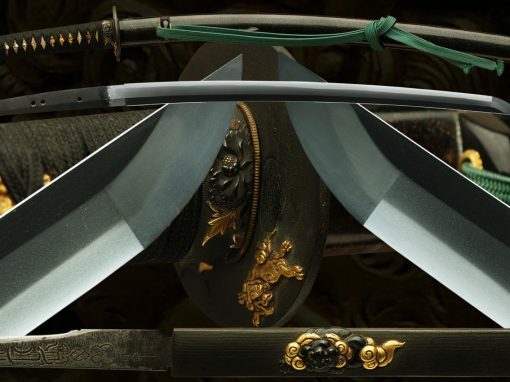 This early katana still retains the signature though suriage and also has an elegant shape and is very well balanced. 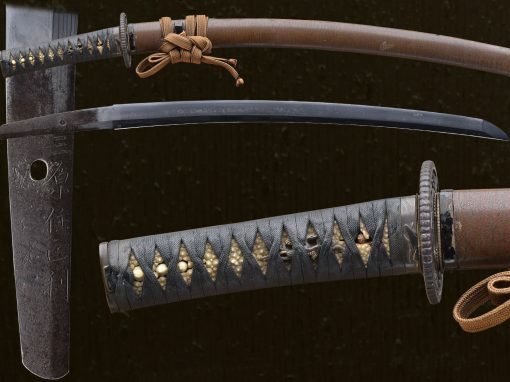 The mounts are in very good shape and add to the overall value of this sword. 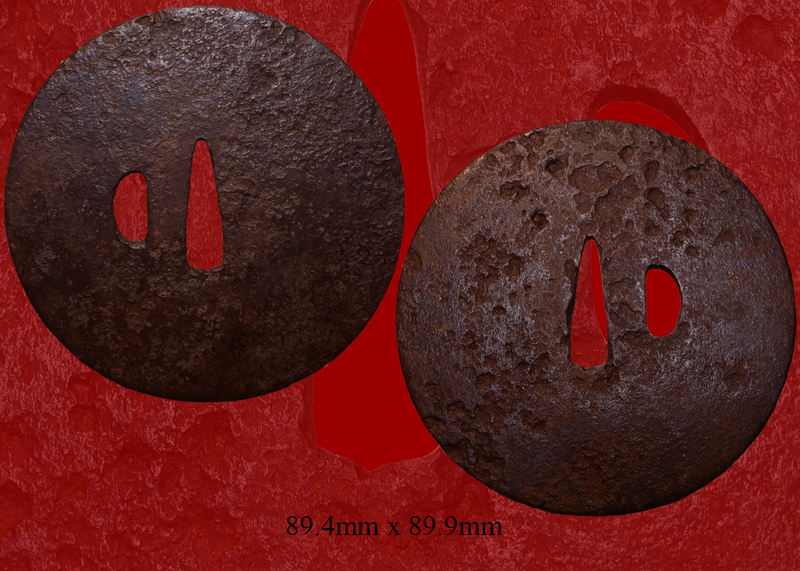 The fittings are sound and have a more simple and traditional look and display very well. 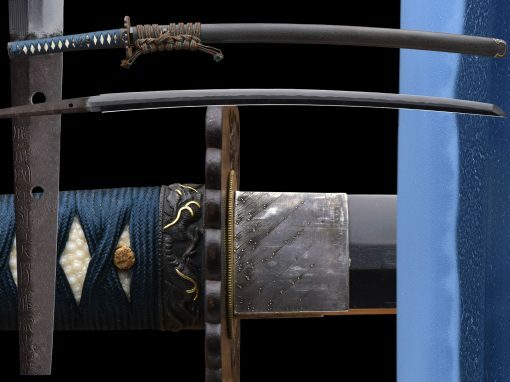 Overall this is a fine Japanese katana. 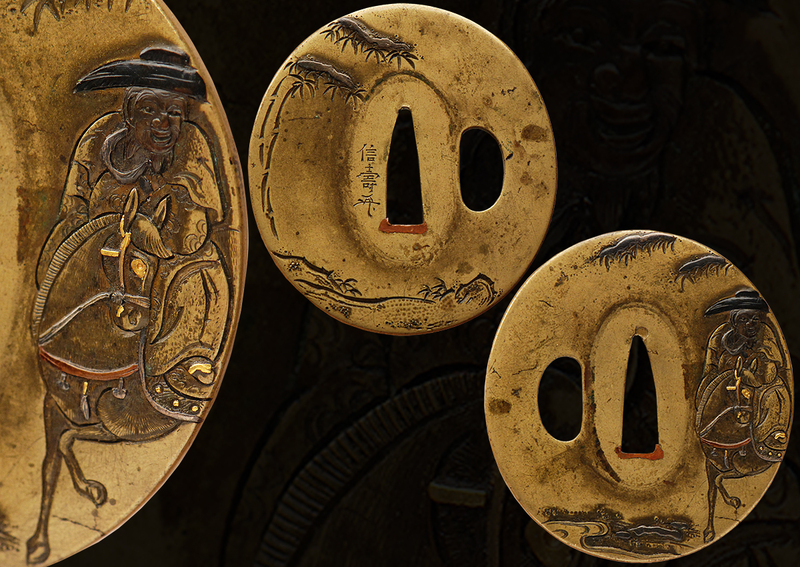 The menuki are a gold washed Shi-Shi theme. 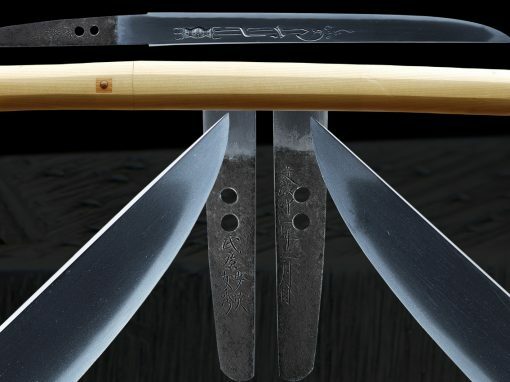 The mounts are of good quality from tsuka to saya. 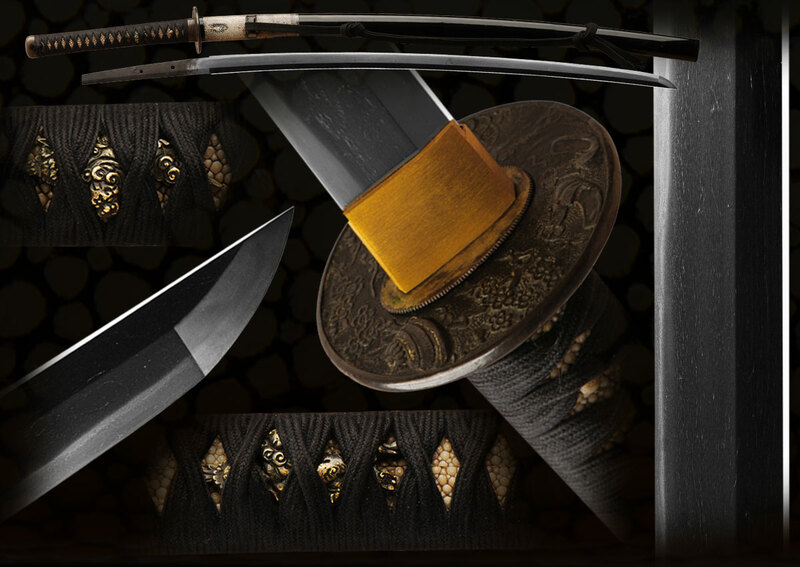 The theme of the menuki beautifully finish the tsuka and saya with an steadfast black tsukaito wrap. 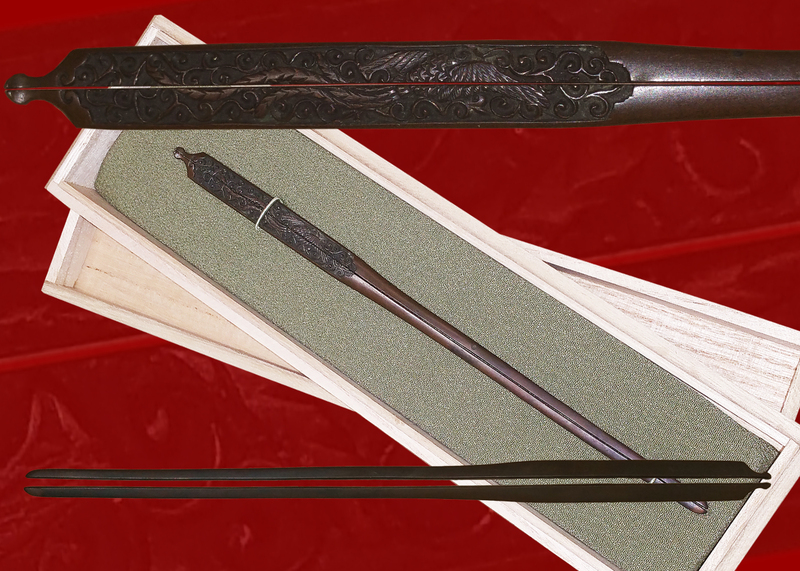 The saya is black lacquer with rayskin in the upper portion . 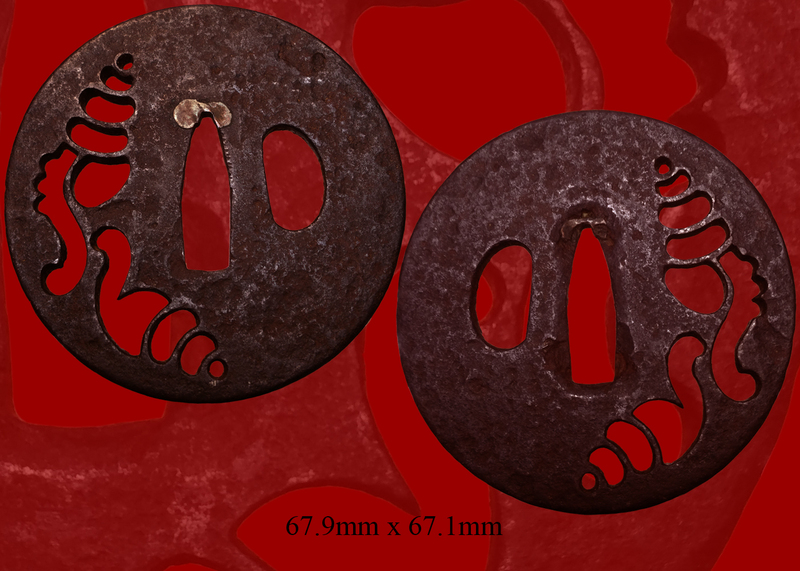 The shi-shi menuki motif was often used as a theme for Asian art. 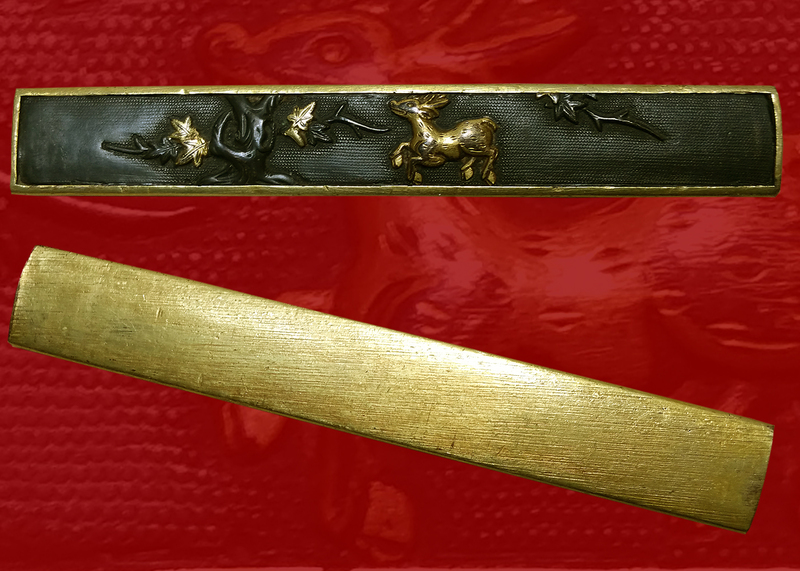 Mythological subjects and auspicious symbols were sometimes used as motifs for Japanese sword furniture. 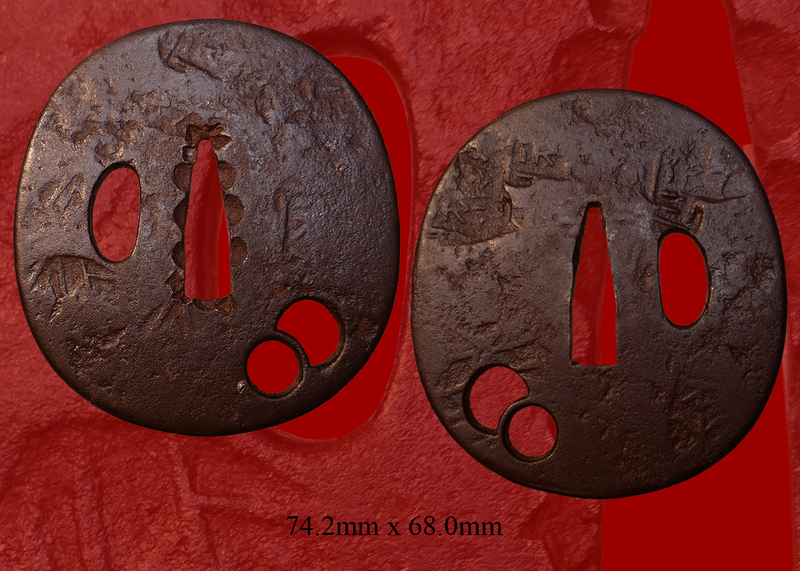 Motifs could stand alone as designs unto themselves, particularly if they had seasonal or symbolic associations, but they were also used as decorative patterns surrounding or backing more pictorial motifs such as this. 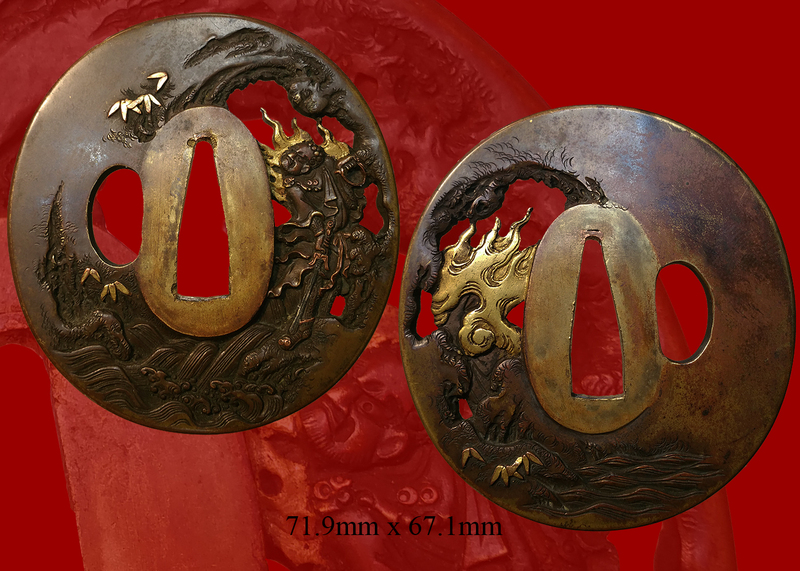 The habaki is finished in gold wash. 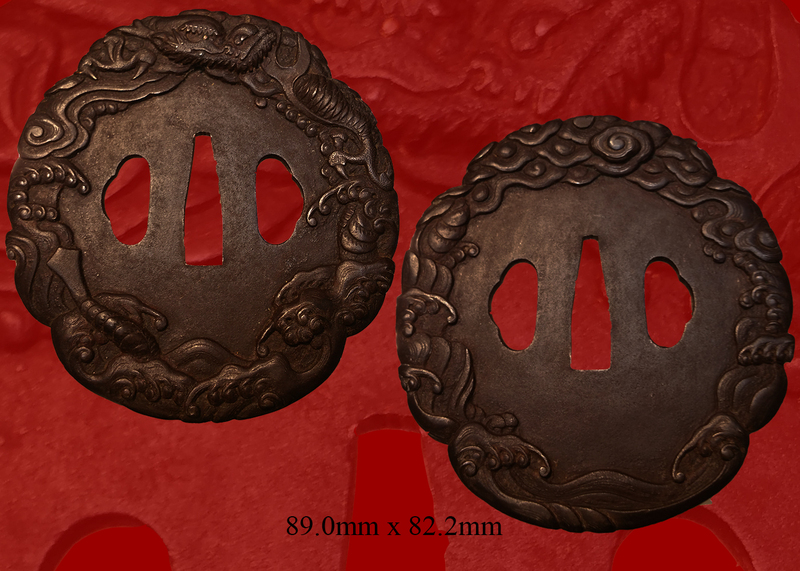 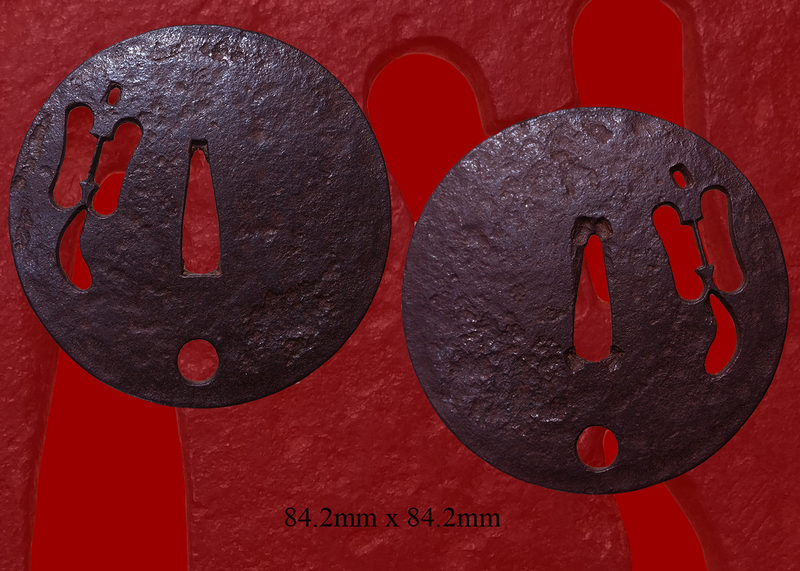 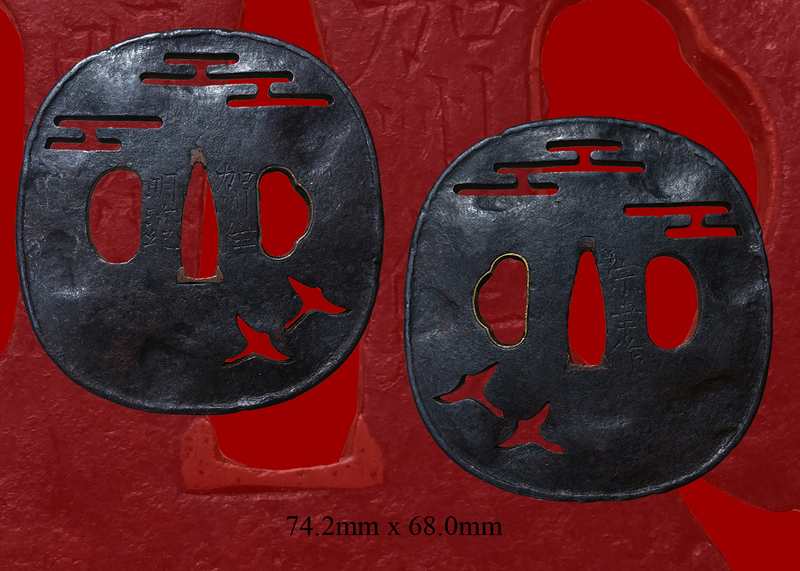 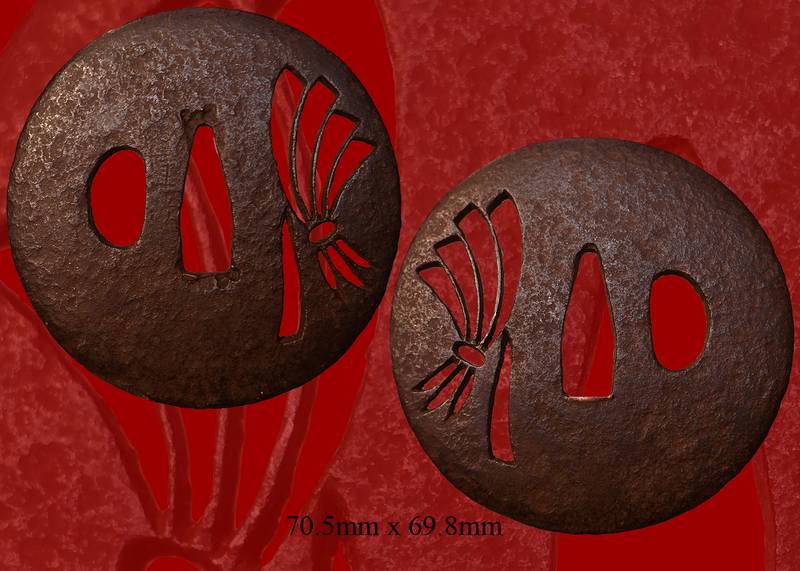 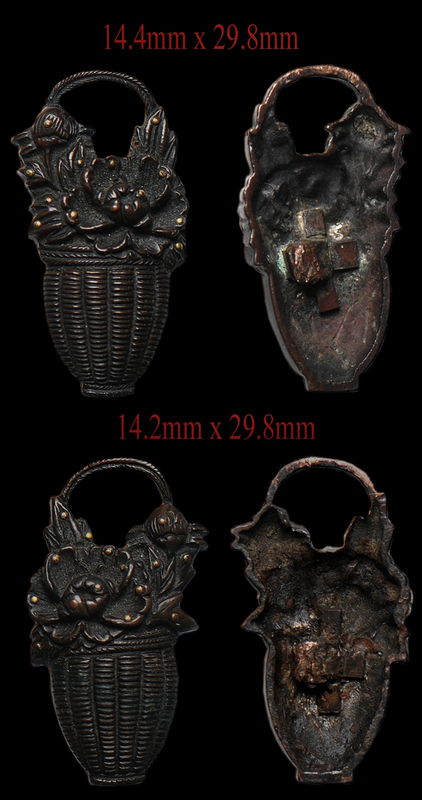 The tsuba is copper/shibuichi and has an assortment of samurai accoutrements. 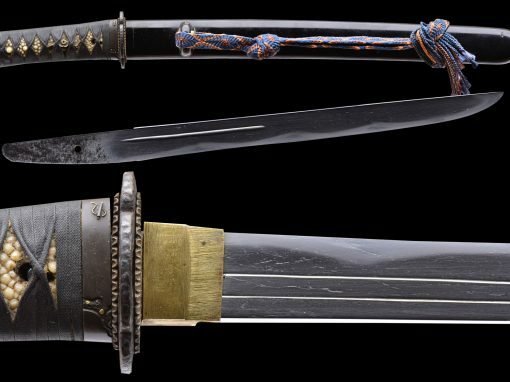 This is a wonderful old sword for a collector who wishes to view and study an older blade! 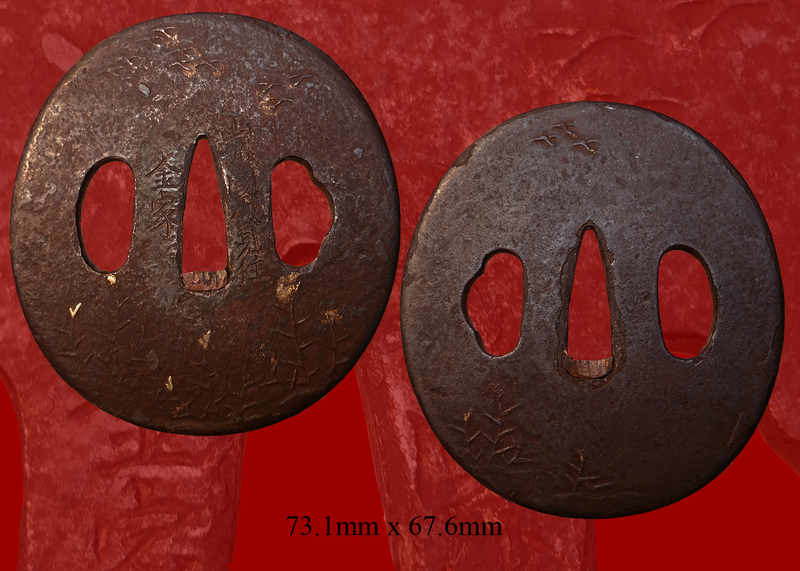 Email us if your interested in this item and remember to include the order number for this item: fss-675.